I want to wish you all a prosperous, healthy, safe and prepared new year! 2017 brings a lot of challenges and unknown events. We never know what the future brings so the best solution is to prepare for the unexpected. I hope you’ve already set your prepping-related resolutions for the new year. Here are 5 articles I’ve stumbled upon this week that will help you stay safe in a lot of SHTF situation 2017 may bring. “When it comes to preparing for any sort of SHTF event it really is a guessing game. All we can (and should) do is prepare for the worst and hope for the best. There is no way to know exactly what might happen, but we can stack the deck in our favor by learning new skills, maintaining our health and preparing for these disasters while we still have the opportunity. Video first seen on sab7sam7. “Emergency, like natural calamities such as flood, typhoon or hurricane, and earthquakes are a dangerous situation, requiring an immediate and fast response to avoid unwanted results ? injuries or death. Being able to make sure that you are safe before, during, and after any disaster is needed to counteract or respond effectively. What is needed is preparedness. According to the Federal Emergency Management Agency in the U.S., it means a continuous cycle of planning, organizing, training, equipping, exercising, evaluating and taking corrective actions in an effort to ensure effective coordination during incident response. 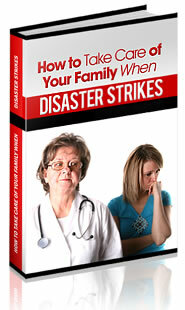 Emergency Preparedness can save your lie or your loved ones lives. “All too often, the world is shaken by a new flu bug or the resurgence of an old one. This article caught my eye, as it’s about a mutated version of avian flu H7N2 that was transmitted from a cat to a human, quite a rare occurrence. I also have a long enough memory to recall the Ebola panic just a couple of years ago and shaking my head at the incompetence and poor decision making by those in authority, including the CDC. “With the terror of the Orlando shooting, people all over the country are reevaluating survival tactics for mass shootings. The general consensus is that the decisions you make in that first few minutes will largely determine whether you live or die. It is easy to mourn the dead and tell yourself that victims were trapped and had no choices. While your choices are limited, you do still have them. “Twenty-first century homesteaders have the advantage of being able to pick and choose between ancient practices and modern technology, selecting the one that works best in every situation. At my place, I love old-fashioned methods, but not when it comes to biosecurity.